Exotic cats are elegant felines, each wild cat evolved unfettered by human intervention! Exotic cats are extremely beautiful, alluring creatures. The term exotic cat generally refers to wild cat species that are kept as pets or in domestic confinement. This category includes all types of wild species, from smallish bobcats to very large tigers, as well as all endangered wild cat species. Most people experience wild cats only in zoos or in photographs. These cats are so attractive and enchanting, that there's a natural desire to want to pet one and hear its purr. There is wonderment too! Is this cat really different than our domestic companions? The answer is yes, and no. Living with an exotic cat can be an amazing experience, as these creatures can have the same loving and affectionate demeanor as a domestic house cat. Yet the reality of keeping an exotic cat is not at all the same as keeping a house cat. The very real challenges are much greater than keeping the average pet cat. Exotic cats are not for everyone, they require a very responsible and dedicated keeper. The list of exotic cats covers small wild cats as well as large exotic cats. Each cat guide provides the history and background of the exotic cat along with a description, care, and a picture. Make sure you understand the type of exotic cat your are getting, and that it is the kind of pet you want and are willing to commit to. To own an exotic cat is a great pleasure and extraordinary experience indeed. But keep in mind that exotics are not only unique, but are also a very large lifestyle commitment. Exotic cats are simply not for everyone. Giving an exotic cat a home is a very large responsibility and there are many considerations that must be taken into account before purchasing one. A small wild cat will generally have fewer requirements than a large exotic cat or endangered wild cats, but keeping either is a very large responsibility. Commitment to the decision to obtain an exotic cat should not be taken lightly. These cats can live up to 20 years or longer, and you must be able to make the decision to be a companion to the animal for its entire lifetime. Small wild cats are somewhat easier to place in new homes, but large exotic cats are extremely difficult. If you decide you no longer want the cat for some reason, it can be extremely difficult to adopt it out. Many animal shelters will not take exotic cats, and most normal people are not prepared to take on a wild animal. Not to mention cats get used to their homes and may not do very well being transferred to a new location or a new owner. Are Exotic Cats Legal in Your Area? If you are considering obtaining an exotic cat, the first thing you will want to do is to check out your local, state, federal, etc. laws that are applicable to the type of cat you wish to get. Many wild cats require permits, but it varies by type and location, so you would have to determine if you need one. Beside a permit, some other things you may need can include a certificate of health from a veterinarian, a bill of sale, and possibly a transportation permit and a permitted habitat. If the type of cat you want is on the endangered species list, it may make it even more difficult for you to obtain one. You will want to research breeders as well and make sure that you are purchasing your cat from a publicly recognized responsible breeder. Basic Wild Feline Husbandry Course. If you are serious about getting an exotic cat, a valuable care and husbandry class is offered by the Feline conservation Federation (FCF). This is an 8-hour course focused on responsible captive husbandry of wild felines. It is suitable for all levels, novices to experienced keepers. If you want the wild look of an exotic cat, but without the difficulties and permit requirements that often accompany exotic feline ownership, consider a Hybrid Cat. Hybrids cats can be perfect for people who are fascinated by exotic cats. They still have more extensive requirements than other domestic cats, like the Natural Cat Breeds or Mutation Cat Breeds, but are not quite as big of a commitment. There are a number of hybrid cats that make excellent pets, such as the Bengal, Chausie, Savannah, and Safari. Large cats generally have expensive needs, including housing, feeding, and vet bills. Of course the initial cost of purchasing the cat is often expensive as well. The smaller exotic cats can sometimes be easier to care for in all of these regards than the larger ones. Many of the larger cats will need outside enclosures that can be expensive to construct and maintain and they must include areas that let the cat get out of the rain, snow, or extreme heat. They also must be escape-proof, because the escape of these large cats can be quite detrimental. Large cats have specialized feeding as well – they must have a good, nutritious diet and it may be difficult to obtain commercially prepared food for them. Also, you will need to find a veterinarian in your area who is willing to treat large cats and will agree to treat yours before you get your cat. The behavior of these large cats can vary dramatically depending on the type and is quite different from a typical domestic house cat. This should be anticipated and prepared for. Of course all cats have individual personalities, but some generalizations can be made from species to species as well. For instance, some of the larger cats may be more dangerous to be around and you may not be able to go into their houses without much precaution. Some of the larger cats that may be kept in the house may be more prone to destroying furniture and spraying everything. Some of these cats will also be more readily willing to learn tricks and follow directions, and some will be less willing to. Bobcats are a smaller large cat and can range in weight from 12 to 30 pounds. They are cousins to the lynx but are slightly smaller than them. In captivity, they tend to be more on the aggressive side and are also known sprayers. Caracals are also known by the name Desert Lynx and are primarily from North Africa and Southwest Asia. Caracals often hiss, which can be alarming to some people. They can range from 15-45 lbs. Asian Leopard Cats weigh 7 to 15 lbs, with males being larger. They are considered extremely shy and therefore hard to domesticate. These are bred to make the domestic Bengal Cat. Cougars are also known as pumas or mountain lions and can be considered a large cat due to size. They range from 75 to 250 pounds. Even due to their size, they are often considered one of the more affectionate large cats, and they have the ability to purr! These are very small South American wildcats, averaging 4 to 8 pounds, and they are very adaptable to just about any terrain! Geoffroy's Cats can be very affectionate and definitely form bonds with their owners. Jungle cats are usually found along rivers and in forests, not in jungles, so the name Jungle Cat is not very accurate. They can range from 10-35 pounds in size, with the females generally being on the smaller end of the range. These cats are actually fairly easy to domesticate if they are handled from a young age and bottle fed away from their mothers. 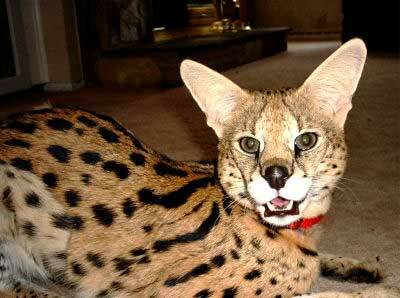 Servals are from East Africa. In their native country, they are actually bred as pets and domesticated! They can range from 18-40 pounds. They Lynx has a short tail and can range from 11-30 pounds. They are a good medium-sized exotic cat. The Iberian Lynx has a critically shrinking population in the wild, and is an endangered exotic cat. They originate in Southern Europe and right now only about 110 cats are left in the wild. The Ocelot cat, native to the America's is also endangered. They weigh 20-33 pounds and are considered endangered. They originate from North, Central, and South America. Mountain lions are also known as the pumas or cougars and can be considered small cats due to their disposition. They range from 75 to 250 pounds. The clouded leopards are from Asia and weigh from 25-50 pounds, with the males being much larger than the females. There are six tiger sub-species, all of which originate in Asia. This group contains the largest cats, weighing between about 300 to 700 pounds with a tail that's about 3 to 4 feet long. The Siberian Tiger is the largest cat of all, usually weighing about 650 pounds. Full grown tigers can be dangerous to have as pets. These are more difficult large cats to come across and to keep on your own. Cheetahs are from Africa and are the fastest animals on land, with a top speed of 70 mph. Reaching between 75 and 145 pounds, the cheetah is a fairly large cat, but they are generally easy enough to tame and become very affectionate towards their owners. This makes them a popular cat among large exotic cat owners!